It&apos;s been 10 years since Marcel Vigneron first appeared on Top Chef. While he was then known for being seriously into molecular gastronomy, he&apos;s now going back to simpler and rustic food with his first restaurant, WOLF. WOLF recently opened on Melrose Avenue in West Hollywood, taking over the former ROFL Cafe space. It&apos;s since had a major makeover, with a sleek and hip design. As you walk through the narrow and long restaurant, your eyes draw towards the centerpiece of the room: the bar in the back, which has a stunning, large mirror shaped like a tree stump, and a tiled bar counter in gorgeous hues of turquoise. Two Medieval-style chandeliers hang from the distressed wood ceiling. It&apos;s dimly lit and intimate, but when the restaurant fills up, lively chatter from the patrons fills the room. We stopped by WOLF for dinner to sample some dishes on the menu, and spotted Vigneron, whose hair was pulled back in a short ponytail, in the kitchen of his restaurant moving dishes along. It&apos;s hard to not recognize his face; after all he&apos;s been on reality TV a lot, from hosting his own SfFy show Marcel&apos;s Quantum Kitchen, to making appearances on Food Network&apos;s Cutthroat Kitchen and Iron Chef America. His first TV appearance was when he was a contestant on season 2 of Top Chef, where he ended up being the runner-up. At one point, he worked at Bazaar, too. No, not really. It&apos;s funny, and a lot of people don&apos;t seem to realize it, but when I did Top Chef season 2, that was over a decade ago. And when you&apos;re younger, you always have something to prove and it&apos;s all about showing off cool techniques. But as you get a little older and a little wiser, it&apos;s a lot less about you, and a lot more about your craft. I don&apos;t need to show people that I can do cool stuff—at the end of the day I want to show people that I can make delicious food. Vigneron&apos;s dishes at WOLF are influenced by global cuisine, from the different cultures that make up the fabric of L.A. Many of his plates specifically touch upon Southeast Asian flavors, by using ingredients like fish sauce and coconut. The ingredients in general are seasonal, local and fresh. WOLF&apos;s m.o. is "zero waste cooking," where every part of every ingredient is completely used. On the menu&apos;s appetizers section (dubbed "snacks"), we find a hamachi crudo, a trendy dish we&apos;ve been seeing on many L.A. menus recently. 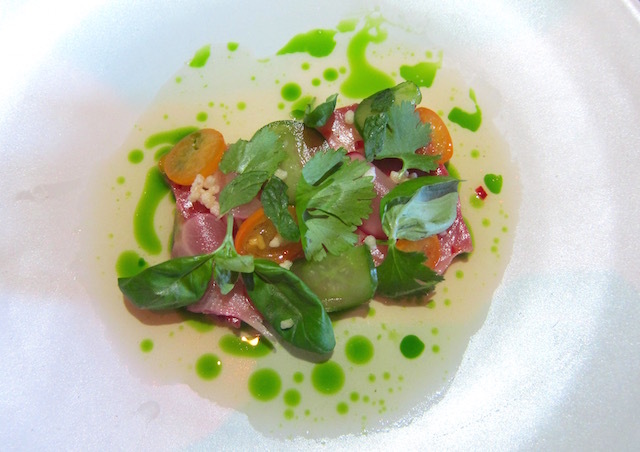 Vigneron&apos;s crudo is a playful one, where it&apos;s covered in a nuoc cham Vietnamese fish sauce. Thin slices of kumquat adorn the plate, giving the dish a sweet tartness that complements the sauce, and puffed rice that offers variety to the texture. The burnt carrots consists of unpeeled, charred carrots that sit on a nice coconut foam. It&apos;s a dish that is influenced by Thai flavors, but employed with different ingredients. Instead of peanuts, it has chopped-up bits of toasted macadamia nuts, and the oxalis gives a sour burst of flavor when you bite into the delicate leaves. It&apos;s accompanied by a passion fruit sauce, and is well-balanced with smoky, sweet and sour flavors. Fish sauce makes another cameo in the restaurant&apos;s Brussels sprouts dish. The Brussels sprouts are roasted until their leaves are crispy and charred, but instead of a balsamic vinegar, this one is coated in a fish caramel sauce. And fish caramel is exactly like it sounds—the veggies are candied with an umami aftertaste. We&apos;re glad Vigneron mixes it up by also adding tender, quartered turnips into this side dish; because of the sweetness of the caramelized leaves, we need something lighter to balance it out. On the lighter side, a newly-added broiled scallops is a fresh palate cleanser, with a ginger lemongrass emulsion and kohlrabi. This dish is also topped with oxalis, like many of the other dishes on this week&apos;s menu. As we&apos;ve been on a mostly Southeast Asian kick with Vigneron&apos;s dishes, we suddenly turn to the vadouvan lamb rack, which is a different beast of its own. It&apos;s actually almost a little jarring to go straight from Vietnamese flavors to Indian curry spices, even though the dish is well made. We order the lamb medium rare, and it comes out perfectly tender and moist on the inside, crispy on the outside, with some melt-in-your-mouth fattiness by the bones. This lamb is less gamier than your average lamb because they get the meat from a special farm. What we do wish is that jus accompanying the meat would be bolder to match with the strong flavors of all the other dishes we tried. Finally for dessert, there&apos;s the blueberry soufflé and banana bundt desserts. The sweets are so very different that it&apos;s surprising they are even on the same menu. 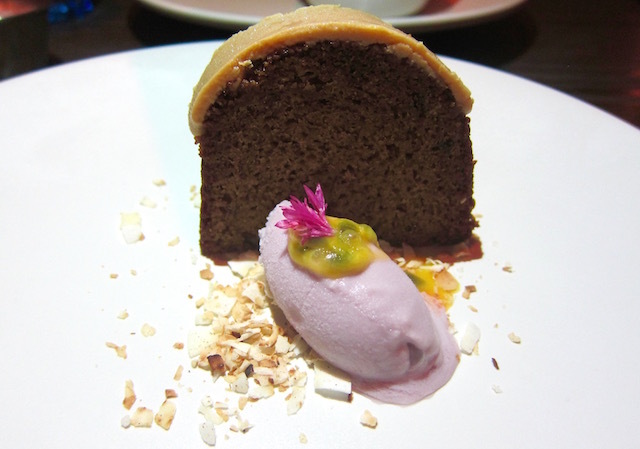 The banana bundt dives back into bold flavors, with a spicy habanero hibiscus ice cream quenelle sitting on top of toasted coconut and next to a dense banana bundt cake covered in a thin layer of burnt honey ganache. It&apos;s a busy dessert with lots of flavors. The blueberry soufflé has floral notes thanks to the spoonful of violet ice cream that the waiter puts into the dessert right after it&apos;s brought out to your table. The fluffy and airy soufflé is made with blueberry vodka, so you get a very light taste of the blueberry, and one that is almost more aromatic. Although this dish doesn&apos;t seem to fit with the rest of the menu&apos;s theme, based on the more Asian-inspired dishes we tried, it is our favorite dessert of the night. And you can wash all that down with one of the many craft cocktails that are made with house-made tinctures, shrubs, sodas and organic juices. As for the meaning behind "WOLF," it&apos;s an homage to Vigneron&apos;s mother and her maiden name, as she was the one who inspired his love for food. There&apos;s a lot of heart in this place and we can feel it. WOLF is located at 7661 Melrose Ave. in West Hollywood, (323) 424-7735. Dinner appetizers from $6 - $18, and entrees from $22 - $34.